We’d love your help. Let us know what’s wrong with this preview of Crafter's Passion by Kris Schnee. Stan can't afford to have his brain removed. The richest and luckiest players of the video game "Thousand Tales" get their minds uploaded to its virtual paradise world, while Stan can barely buy a handheld console. Instead of sulking he plays, and grows, becoming a skilled craftsman and seafaring explorer. The game's ruling AI, Ludo, helps him find the hope and inspiration Stan can't afford to have his brain removed. The richest and luckiest players of the video game "Thousand Tales" get their minds uploaded to its virtual paradise world, while Stan can barely buy a handheld console. Instead of sulking he plays, and grows, becoming a skilled craftsman and seafaring explorer. The game's ruling AI, Ludo, helps him find the hope and inspiration missing from his real life. When the AI starts asking for favors and having him reach out between the real and digital worlds, Stan has a chance to turn his life into an actual adventure. But first he needs to earn the most valuable prize of all: his freedom. "Crafter's Passion" is part of the emerging "LitRPG" or "GameLit" genre, combining science fiction with the world of gaming. On Island East-2 stood Stan, in the dungeon, with the rickety raft. He dragged it out to the beach, scavenged more wood and some interesting shells, and paddled his way back west. The raft disintegrated just as he got within sight of East-1. He held onto a chunk of wood to help him float but couldn't carry the rest in his pack. All he could do was start swimming! A scary fish swerved into his path but he managed to detour until it lost interest. Finally he sprawled onto the beach with a bunch of stat penalties for being wet and tired. Belatedly he realized, "I probably ruined everything in my backpack." That sounded reasonable. He'd assumed that jumping into the water with a load of items was harmless, but that was his own fault. "Fine." He headed west to Central Island across the bridge. So far he just had that crude backpack full of loot, and he couldn't carry much more without a better pack. He looked over the junky resources he'd scavenged, then the items he'd looted off his party members' bodies. None of the equipment was listed as magical, and the item descriptions were starting to give him more serious labels like [Crude Wooden Bow] for Alaya's weapon. Even he could probably make something better with a little practice. He could make something better! That could be fun. Besides, he'd swiped this gear from people he'd agreed to help, so maybe he could replace or upgrade the stuff by way of apology. Stan headed over to the Crown & Tail's workbench to give it a try. Along the way he jumped around for the fun of bounding up the sunny shore. The bartender directed him to the "maker workshop" a ways inland from the beach. It looked like an old fort, a squat wooden cabin surrounded by a spiky wall of logs. Why not a giant golden palace? Probably it had been built by the players using the game's own physics. That was pretty neat. He walked right in through the open gate. Inside was a craftsman's playground. Saws, drills and other tools covered some of the tables. A whole corner was devoted to colorful glassware and bubbling fluids. 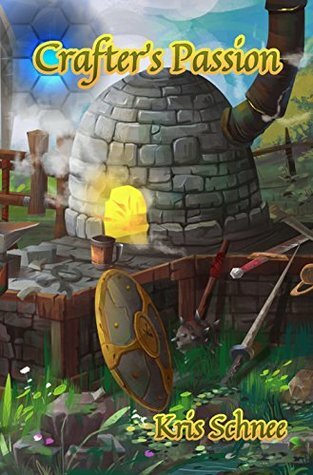 A green-robed figure was busy at that alchemy station, pouring beakers one into another and making puffs of steam. The only other person here was a smith in a leather apron and goggles, making a pleasant rhythmic ringing of metal. Behind him loomed a forge where slabs of metal were glowing cherry-red. Stan looked around and asked, "Is this stuff open to the community?" To ask other readers questions about Crafter's Passion, please sign up. This one was a little bit of a risk for me: Amazon recommended it, along with a great deal of prurient LitRPG trash. It didn't look like the same sort of thing, and indeed, it was not. This is well-written, deep, thoughtful LitRPG trash. For those who like that sort of thing, this is exactly the sort of thing you'll like. I'm a sucker for any future vision where the individual has to struggle to escape or overcome the all seeing bloated government gone wild, and this book delivers that in well measured doses along with a fun LitRPG romp that doesn't go overboard with the game specifics, but keeps the progress interesting. The relationship between Stan and Ludo, with Ludo's foil, the overseer/baron Hal, is well developed and raises a lot of interesting questions about whether you can trust an AI, and whether AI's could be good or evil, in comparison to good or evil people. Mina the love interest is a little under-developed, but that is fine. There is plenty going on in the story. I appreciate the desire to tell a story in this genre where violence isn't critical to success, and believe that is achieved, although Stan himself acknowledges how that conflicts with the traditional heroic stereotypes. The title says it. I liked the story and the post contemporary world. I found myself curious about the socio political economics of Stan's world. As a LitRPG it is a bit stagnant. Yea , some things really worked and I liked them, however over all it kinda fell flat in the game details. Still, I had fun reading this on while traveling. This book and its sequel don't know what they want to be: a political dystopian novel, a bildungsroman, or litrpg. Unfortunately, the series doesn't really deliver on any of them. This is a two star "it was okay" review because I did find it the exploration of each political system to be fascinating and the author worked hard to represent good people who believed in each system rather than just portraying those systems as all good or all bad. However, the main character was incredibly irritating, This book and its sequel don't know what they want to be: a political dystopian novel, a bildungsroman, or litrpg. Unfortunately, the series doesn't really deliver on any of them. This is a two star "it was okay" review because I did find it the exploration of each political system to be fascinating and the author worked hard to represent good people who believed in each system rather than just portraying those systems as all good or all bad. However, the main character was incredibly irritating, naive and his crafting quests had no depth beyond "push this button then that", even though the whole point was a character who delved into crafting with, if you excuse my phrase, passion. Had the author known each field, it would have been much better a read. The ideal of going from indentured servitude (not that much different from any system with a mandatory draft) to working as a pizza clerk ("Would you like pepperoni with that?") while playing video games all day, while the video game begged the character to get a life, was incredibly depressing. The game world was sparse and dull. The real world was far grittier and more interesting and we didn't spend nearly enough time there. The only thing the books really have going for them is the fresh worldview that explores some politics (although each system is warped for dramatic effect). You get the capitalists, the socialists, the libertarians, and the book concludes they're all jerks: what matters in life are the interpersonal connections you make with real people who surround you. That's great except for moving on from there to "so ignore them, let your body deteriorate, and let's play video games all day every day". Do you want the coasting easy life or the challenging unknown adventure where you are responsible for your own fate? An adventure in possibilities, and the seeking of one's own path and way in life. This story is an intriguing look at a possible future both in some ways seeming unlikely and in others all too likely. I particularly like the portrayal of the AIs and can empathize with the main characters struggle with what to do with himself. Wow, this book was so blah. The story seemed to be lacking anything resembling action and the MC was whiny, extremely naive and his crafting (which the title portrayed as being important) was unfocused and frankly uninteresting. I did like the main AI and appreciated his/her interactions with everyone, but not enough to enjoy this story. Waste of both time and money. There are a ton of LitRPG books out there that you are better off with than this. This isn't some epic quest story. It has a feel to it of what the future just might hold. I personally didn't like the society the MC loved in, but it felt real. I was glad to see him leave it behind. I could recommend this book to those that enjoy a more realistic look into the future. Explores some political and social issues. But the game take and AI purpose was fun and unique. It also explores the purpose of self and life and motivation and dreams/goals. Good book. Not for everyone. But i found it a good experience and was worth my time. To the author: thanks. Was a great read! It's a pleasant read with causal connections to AI without it being monstrous or terminator style. How to interact with having a passion for crafting rather than mass destroy. It overall was steady, smooth flows. Not a lot of romantic situations, by none. Looking for a new way to game or think of gaming give it a go! The story is cute, warm, and even sweet in places. It is far more real than most LitRPG stories, and offers a future that is terrifying in its content and likelihood. Enjoyable and different; you should give it a try. The real world and game world stories go well together. I'll be looking into his other books. Interesting twist. dragged in parts. An interesting concept I can unfortunately easily see happening for real. Glad to see the main character breaking the mold. Highly recommended. Just ok. I don't regret listening, but it's just not super engaging. I might read book 2 just to know what happens, but I don't NEED to know, you know? A LitRPG story. A interesting story that introduces the social credit score and how the game AI interacts with the real world.